The Bluegrass Beacons perform traditional American and gospel tunes. 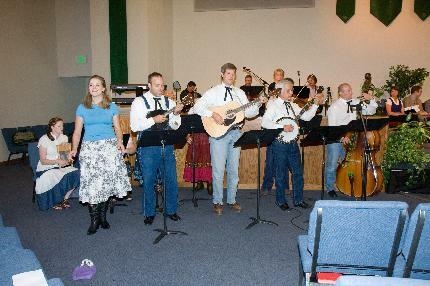 The group has played at Starlighting in Castle Rock, the First United Methodist Church of Castle Rock, the Grange in the Meadows, St. Luke's United Methodist Highlands Ranch and the Grand Hall at Idyllwilde in Parker. The Bluegrass Beacons feature Bruce Blomquist on bass, Ed Coryell on guitar, Kent Husa on fiddle, Shawanna Quirk on washboard and percussion, Matt Rose on guitar, banjo, and mandolin, Penny Rose on autoharp, and Erin Stewart on fiddle. Auxiliary members include Dan Filipiak on banjo,� Carolyn Ayotte on fiddle, Traciann Heisler on fiddle, Ed Law on guitar, Emily Nelson on vocals and Aislin Stewart on percussion and vocals. The Beacons perform at the Grange in the Meadows. The Beacons perform at St Luke's Highlands Ranch.